Above photo by: Jack Hobhouse. Used by permission. Last week, Carrie Behar attended the University of London’s Zero Carbon Challenge event, where a team of committed professionals worked together to ‘crowd source’ an ambitious sustainability strategy for the university. 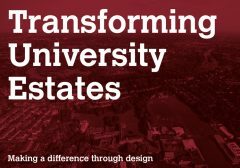 With the higher education sector facing unprecedented challenges, now is a good moment to reflect on how good design and strategic thinking can transform university estates and enable them to thrive. Universities are expected to meet and report on ambitious environmental performance targets. Some universities have developed effective strategies to reduce carbon emissions whilst addressing the needs of the wider estate. However, given the challenges facing university estates, it is perhaps no surprise that 75% of campuses are forecast to miss their 2020 carbon reduction targets. Direct Government Funding is declining while costs rise. Direct government funding currently provides only around 1/3 of costs; therefore, universities are facing increasing pressure to raise money from other sources, including overseas tuition fees and through collaboration with industry. Between 2015/6 and 2019/20, Government funding to HE institutions reduced by £120m, a trend which is expected to continue falling. The median space utilisation rate across the UK HE Sector is around 27%. [iii] This is equivalent to providing 3.7m2 for every m2 being used. [iv] This means that, typically, universities use approximately half of their space, half of the time. Approaches to Teaching and Learning are rapidly evolving. A 2016 UCISA report showed that 79% of universities foresaw changes in staffing provision to support the use of Technology Enhanced Teaching (TEL) tools in the near future[v]. To respond to these changes, a responsive and agile estate is required, as innovations are introduced and research and teaching practice adapt accordingly. Doing more with less as an approach helps leverage the value of existing buildings through ‘light touch’ refurbishment, space optimisation, and tuning infrastructure performance and building campus identity through signage and wayfinding.. Inefficient use of space can be improved by developing strategies for shared use of estates and services, and can lead to a more lively and active campus while ensuring high utilisation. At St Mary’s University we worked with colleagues at Useful Studio and Thomas.Matthews to design a series of small interventions which had a big impact, both in terms of improving carbon performance and enhancing student experience. For larger and more strategic interventions, it is important to harness capital investment programmes and to develop the whole life business case to support board approvals. The impact of design solutions on long term operational and maintenance costs are often not considered, leading to wasted resources and inefficient practices. At 22 Gordon Street we supported UCL in taking a reviewing design and construction options against energy, carbon and cost performance over a period of 25 years. Using this approach, we demonstrated the whole life value and carbon benefit of retaining the original concrete frame. The impact of building design professionals on future human health is only just beginning to be understood but is predicted to be greater than that of doctors. We spend most of our lives indoors, and over 70% of our health is determined by the built environment. Considering the health and wellbeing of students and staff is an essential part of maintaining a successful campus – both in terms of mitigating potential harm (e.g. from VOCs, overheating and poor lighting) and maximising the positive impacts (e.g. through active design, healthy materials and comfortable internal environments). We worked with the University of Westminster on several projects to enhance health and wellbeing across the campuses, including energy and sustainability audits, a suite of SKA assessments and developing a Sustainable Building Standard for capital projects. Buildings are often found to be underperforming – in terms of comfort, energy consumption and usability. University buildings are incredibly complex, so to get the most out of the spaces it is important to learn how to operate them efficiently and to implement mechanisms and processes to rapidly identify and resolve problems. Pre and Post Occupancy Evaluation are effective tools for gathering feedback from building users to identify what is working well and to identify possible areas for improvement. At UCL we undertook detailed energy, waste and water audits at two halls of residence, identifying operational emission reduction of up to 40%. Useful Projects has offered strategic consultant services across the university and HE sector. You can find out more about our work with universities and other estate owners here. We have also prepared a publication to illustrate how Useful Projects and colleagues at the Useful Simple Trust have helped universities achieve their ambitious sustainability aspirations.